If you ever want to push yourself out of your cooking comfort zone, try signing up for a CSA (community supported agriculture) share. Yes, they are an up front commitment, but in the ones I’ve participated in, the produce quality and variety has been unparalleled. It can be a confusing concept, mostly because there is no one set way that a farm runs their CSA. The basic parts are that you pay an amount up front, and then receive a quantity of produce weekly based on the size share you choose (a full share often serves a family of four for a week, but again, they vary). Some farms deliver or you pick up a box of produce each week, and you get what you get. Some have a point system, where you get a certain number of points to spend each week and each vegetable or bunch is assigned a value. Plus the CSA model now has branched out far beyond just vegetables. I’ve heard of meat, fish, bread, pie, and even ice cream CSAs. The up front cost can be significant ( several hundred dollars), but if that isn’t in the cards for you there are other options. I participated in a workshare CSA, where in exchange for my weekly share I worked a full day on the farm. Some also have payment plans or accept SNAP benefits. No matter what level of choice you have in your CSA, there is a high likelihood that you will end up taking home a vegetable you’ve never cooked with (and how fun!!!!!). Obviously the internet is an endless source of recipes, but I still love having cookbooks around from trusted sources that I can turn to when confronted with a mystery vegetable. Chez Panisse Vegetables, Vegetable Literacy, and How to Cook Everything are all great references. When I was doing the workshare I brought home some collard greens which I had never eaten, and the only dish I knew of involved a ham hock and a very long cooking time which is not really my weeknight style. I flipped through How to Cook Everything, which had a quick stir fry with collards and tahini, but suggested peanut butter as a substitution. Weird, but SOLD. What resulted was a dead simple dish with a great peanut sauce that coats the greens with a nutty richness. I loved collards at first bite and have made this many times over. I may need a shirt that says “Eat More Collards” to go along with my “Eat More Kale” one….and maybe one for every other vegetable while we’re at it. If this sounds weird to you, just think of it as a peanut sauce that you make in the pan. 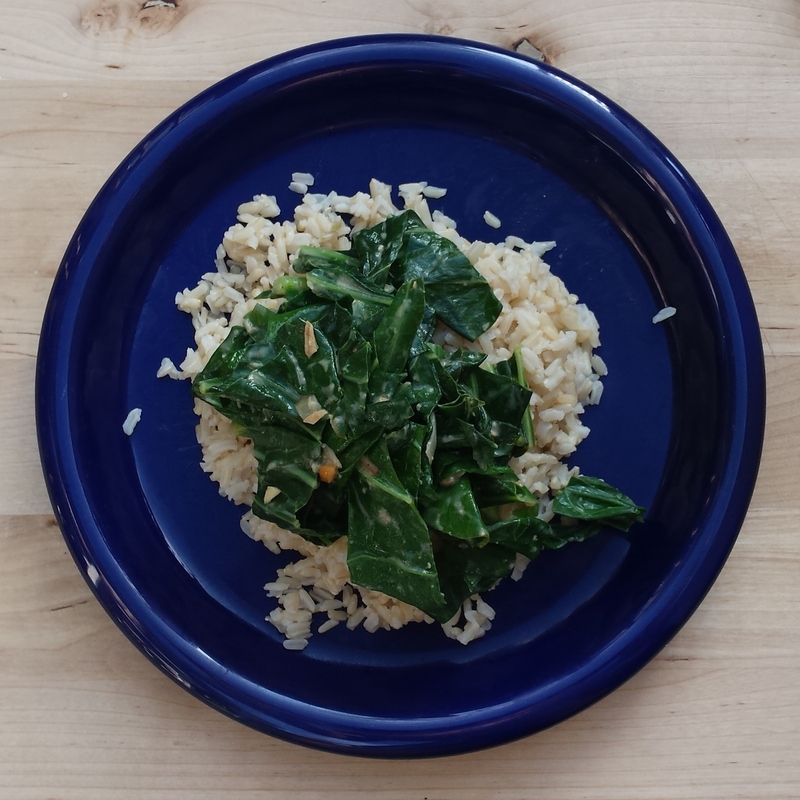 Serve atop brown rice or as a side dish. Especially excellent with rice and soy marinated tofu. Heat the oil in a large deep skillet or pot with a lid over medium heat. Add the onion and cook for 5 minutes until softened. Add the garlic and ginger and cook for 2 minutes until it is slightly colored and fragrant. Add the collards, stock/water, peanut butter, salt, and pepper and stir everything up. Cover and cook until they are wilted, about 5 minutes. Uncover, and cook at a low bubble for 5 minutes more. If the pan looks dry add more stock/water, but you want to have a thicker sauce. Finish with the lime juice, stir, and serve. This entry was tagged collards, csa, peanut butter, vegan, vegetarian, weeknight meals. Bookmark the permalink.